'Lot's wife' cave near the dead sea collapses mere seconds after a visiting family managed to escape it. 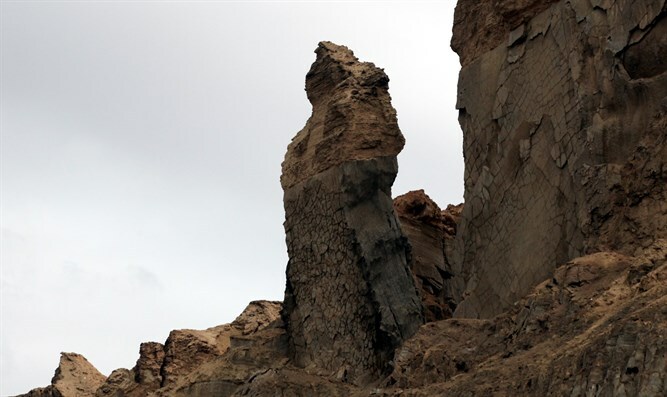 The "Lot's wife" cave near the Dead Sea collapsed mere seconds after a family that was visiting the area managed to escape it. According to reports, the family members were 50 metres deep in the cave when they started hearing rocks sliding down the mountain face above them. Once they understood that the cave is in danger of collapse they started to run out. All the members of the family managed to exit the cave, and a short time later, they watched it collapse. Police and rescue forces arrived at the scene in order to check whether there were additional visitors in the area. In their debriefing, the family members said that they themselves had been in the deepest part of the cave and were therefore sure that there was no one else in it, as they hadn't seen anyone on their way out. The rescue forces still conducted a thorough search of the area in order to make sure that no other visitors were in the vicinity, and that no one was hurt. The cave is named after the Biblical wife of Lot, who was turned into a pillar of salt upon looking back at the destruction of Sodom and Gomorrah. The cave is so named because of a pillar of salt-rich rock outside its mouth, which is said to resemble a woman.